The Tehama County Mentoring Program encourages all mentors and other adults in our community to support the college dreams of our students. 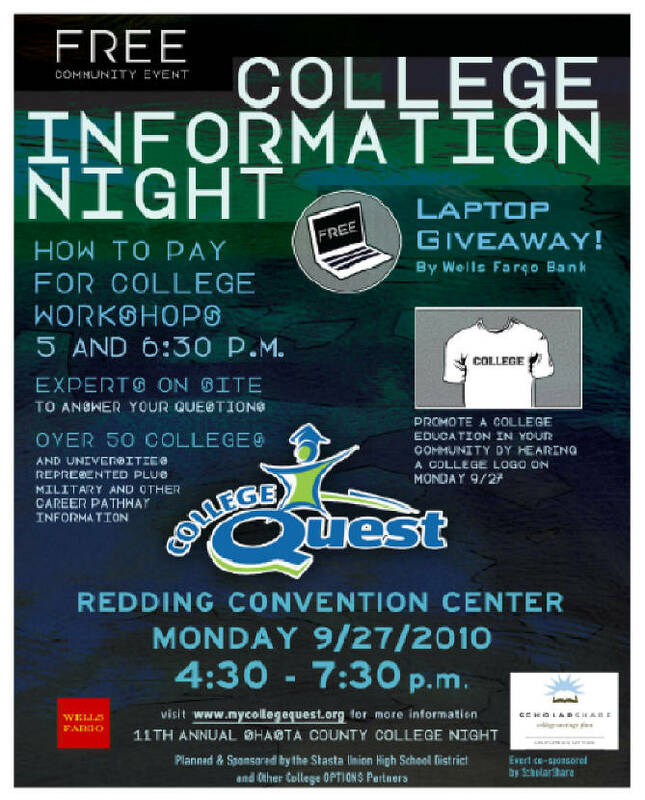 Help them identify appropriate schools and get the information they need to fund their educations by attending College Quest at the Redding Convention Center on Monday September 27 from 4:30-7:30. The Tehama County Mentoring Program has invited its Cross Age Mentors to ride in one of our two vehicles going to College Quest on a first come, first served basis. Cross Age Mentors may reserve their seat by calling 528-7358. 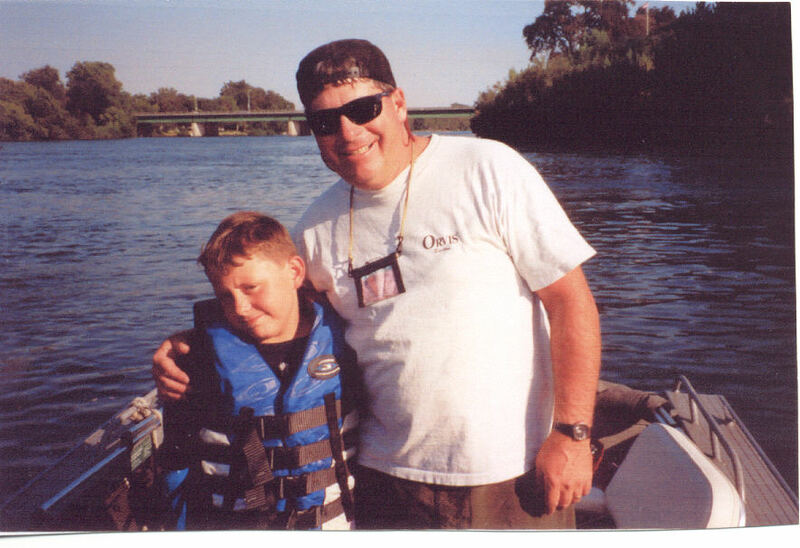 In January 2002, Brad Carter was matched with a 9 year old boy named Dennis in the Tehama County Mentoring Program. Neither was quite sure what to expect from the other but both anticipated an adventure. Today, 8 years later, they are the longest running match in the program and a model example of the power and magic of mentoring. For Brad, helping Dennis through some of the big life lessons he’s dealt with so early in life has been a tremendous opportunity. “Mentoring Dennis has made me feel so fortunate,” he explains. While Brad initially signed up to mentor to give back to the community, it’s clear he has gained just as much as he’s given. His wife, Loretta, has kept a photo album of the time Dennis and Brad spend together and its grown thick over the years with memories from outings the two have made. 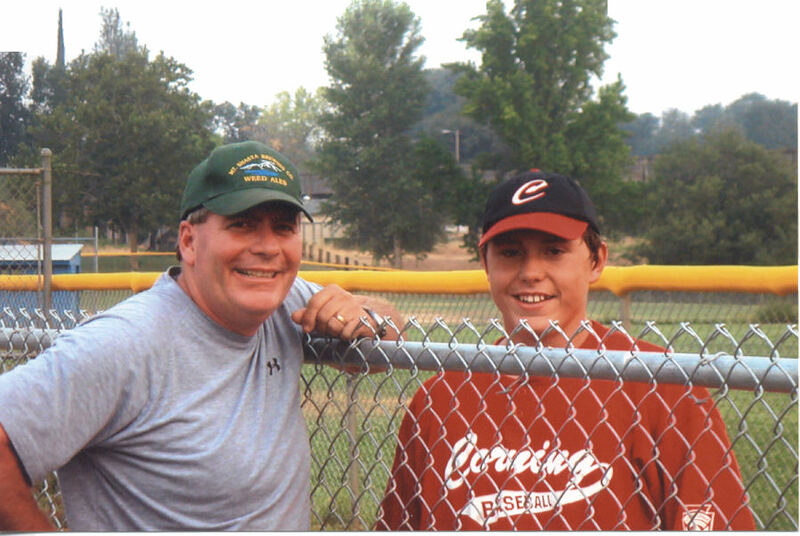 From a young boy bundled up in a life jacket for his first boat ride, to the two dressed more formally for Dennis’ 8th grade graduation, to a proud Brad beaming at Dennis on the baseball field, the photos reveal a deep connection that mentoring consistently over time develops. Dennis’ love of team sports is a success Brad can claim. Soon after meeting Dennis, Brad suspected that he’d do well as an athlete and that the activity would be an excellent outlet for the boy’s anger. Today, Dennis smiles widely as he talks of being a triple athlete—football, baseball and basketball — and has found a positive niche in high school. Season after season, Brad has helped Dennis gear up and get going. Their mutual pride in this success is palpable. While the official mentoring relationship will end with the program when Dennis graduates from high school, we know a lifetime relationship has been forged. Tehama County Mentoring Program’s Americorps*VISTA member, Suzanne Seesman, has been expanding the Cross Age Mentoring Program since she began her VISTA service year in December 2008. During that time, Red Bluff High School student Megan Brunello has become a well-respected and appreciated cross-age mentor. She has been mentoring for two years now at a SERRF program in Red Bluff. Suzanne caught up with Megan to learn more about her. Suzanne writes: Megan Brunello is one of Tehama County Mentoring Program’s Cross-Age Mentors. She is a high school student who has shown a lot of dedication helping her mentee, a younger student in our community, learn and grow. Mentoring is only one of the several ways that Megan is active in and around Red Bluff and I wanted to know what motivates her to do well and be a young leader. At the end of this summer I had the chance to discuss mentoring with Megan and I wanted to let our readers of all ages in on the conversation. Suzanne: Megan what is your favorite…. Megan, you have been mentoring for two years now. How did you find out about mentoring? I found out about it in the bulletin at school. What compelled you to become a mentor? I like kids and I wanted to help out someone who needs my help. What brought you back to mentoring after your first semester? I really liked working with my mentee and seeing the kids learning, adapting and getting better at the things they’re working on. Aside from mentoring what are some of the activities you’re into outside of school? Are you thinking about college? As a mentor your goal is to have a positive effect on a younger student’s life. You have definitely been a great mentor. Do you think being a mentor has had an effect on your life? Yes. I think so. It helps me become better at talking to people. It helps me to get over being shy. What advice, if any, would you give other high school students who are interested in mentoring? I think mentoring is fun and is good for you. You get to work with kids and see how they work in their own environment. I think it’s a good experience. Thank you for sharing your time and experience Megan! Back to School for Lunch Buddies! The backpacks are stuffed with new school supplies, haircuts have been had and fussed-over outfits hang in closets for a dynamic first impression. Yep, it’s the first week of school in Tehama County! That means it’s time for Lunch Buddies to start back up with their mentees after a summer off…..and for new mentors to join the successful program. Lunch Buddy mentors meet once a week during the school year on campus with their mentee. They utilize the school lunch break as an opportunity to share conversation. Both mentor and mentee provide their own lunch. The program was designed for busy professionals who wanted an opportunity to mentor during a fixed time period. It’s also appealed to parents who wish to mentor other children, but can’t commit to extra time outside the school day due to their own family obligations. Mentors may choose a school location based on proximity to their home or work. Students at each school in the county are waiting for the caring ear of a mentor. One lunch hour a week can make a huge difference in the life of a child. Sofia wrote these words on her final paperwork for the mentoring program about three years ago. It is no surprise to anyone that she is now a college student and her mentee is preparing to start advanced high school classes. The Cross Age Mentoring Program offers a tremendous opportunity for high school students to capitalize on their “coolness” to the benefit of an elementary student in need of academic support. There is a magical connection between high school and elementary students that lends its self to mentoring. 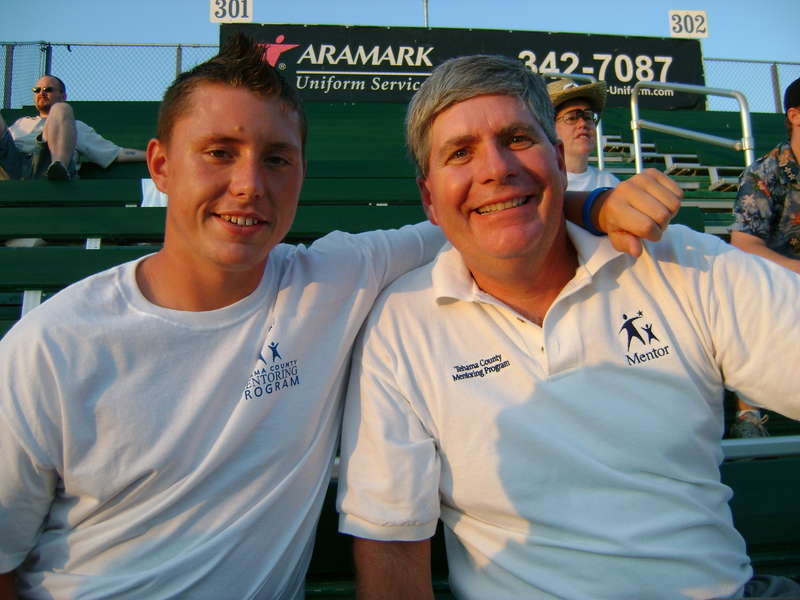 A teenager can have a tremendous influence on a younger student, and the Cross Age Mentoring Program channels that influence in a positive manner. With a new school year gearing up, it’s time to build our force of Cross Age Mentors. High school students are invited to apply to the program through our office at the Department of Education. Mentors must commit to at least one day a week after school for an entire semester at a SERRF site of their choice. They are welcome to mentor more days than one. Mentors remain with the same mentee for the semester. Cross Age Mentor Coordinator Suzanne Seesman will be on campus at Red Bluff, Corning and Los Molinos High Schools once school begins, but students are welcome to apply directly to our office prior to her visits. We welcome students from public, private, charter and home schools. TCMP Mentor is Volunteer of the Year! The Tehama County Mentoring Program congratulates mentor Barbara Walls for being named Volunteer of the Year by the Retired and Senior Volunteer Program of Tehama County! This exciting announcement was made April 24 at a gala luncheon attended by representatives from the offices of US Representative Wally Herger, State Senator Sam Aanestad, and State Assemblyman Jim Nielsen. Tehama County Chief Administrator Bill Goodwin and Supervisor Charles Willard were also in attendance. Barbara has been matched with her mentee, Dacoda, since March of 2006. A resident of Orland, Barbara made a commitment to mentoring in Tehama County when she realized Glenn County does not have a formal mentoring program. How lucky we have been to have her! Barbara and Dacoda have been quite the pair, enjoying everything from bocce ball to baking, arts and crafts to sports. The Retired and Senior Volunteer Program invites adults 55 and older to contribute to their communities through volunteer service. The Tehama County Mentoring Program has been a host site for RSVP members since 2004 and has grown to rely on the experiences provided by mentors in this category. Other RSVP mentors are Gertrude Crossman, and Pem Lester, both of Corning and Tresha Wing of Red Bluff. There is one thing Barbara Walls and her mentee Dacoda just can’t seem to agree upon: bocce ball. More specifically, who gets to wear the title “Queen of Bocce.” Each has crowned herself with the title and is adamantly unwilling to relinquish it to the other. In addition to bocce ball, the two enjoy trying new recipes in the kitchen, planting things in the yard, and arts and crafts. They’ve explored area parks, seen movies together and are enjoying the menu at Taco Bell. They also enjoy swimming. “We’re water girls,” says Barbara. “We celebrate birthdays together”, says Dacoda, making sure to add that “We make brownies and cakes.” With this, Barbara gives a wink, knowing full well Dacoda is just making sure no one forgets that her birthday is only one month away. And it’s hard for everyone to believe that this birthday will see Dacoda turn 11 years old. The two were matched when she was eight. For Dacoda, “Miss Barbara” has become an important part of her life. “It’s kind of like a new family member for us,” she says. For Barbara, being matched with Dacoda gives her an opportunity to have children in her life again, something she has missed since her own children have grown. Dacoda, hugging Barbara, adds “Sometimes she can’t figure out her problems and I have to help her and sometimes I can’t figure out my problems and she has to help me.” They both agree that their mentoring relationship can be summed up with one word: caring. Active in the Tehama County Cattlewomen, Corning Exchange Club and two flower clubs, Pem is hardly the type to sit around watching TV, but she says mentoring is a great way to keep her from sitting around the house all day and gives her something worthwhile to do. “There are so many kids out there that need help,” she says. Pem is simultaneously enrolled in the Retired Senior Volunteer Program (RSVP), of which Tehama County Mentoring Program is a service site. As an RSVP, Pem receives additional support and recognition with this cadre of senior volunteers. The Mentoring Program is her second RSVP placement. She started with the program seven years ago as a literacy volunteer at the Antelope School library in Red Bluff. Latina Leadership is the newest endeavor of the Tehama County Mentoring Program. Ten 7th and 8th grade girls from Gerber School have been matched with 10 members of Lambda Theta Nu sorority at Chico State University. Each month, the girls from Gerber meet their mentors on the Chico State campus to learn about the college experience, make preparations for their own admittance to college and develop leadership skills which include self-esteem, cultural competency, etiquette and high school success. Below is an account of their first meeting on campus, when the group was greeted by Jesse Eller, the Chico State Associated Student Body President. Jesse was a 2003 graduate of Corning High School! When Corning High Class of 2003 alum Jesse Eller speaks, the classic playground game “Rock Paper Scissors” becomes a powerful metaphor for college–and life–success. Eller, now Associated Student Body President at CSU, Chico, presented opening remarks to 10 Gerber Elementary Students and their college mentors involved in the Latina Leadership project through the Tehama County Mentoring Program on February 13 at CSU Chico’s Bell Memorial Union. He is the son of John and Nan Eller and Donna and Jody Mendes, all of Corning. Eller will graduate CSU, Chico in May with a degree in Agriculture Business. “Rocks are people,” Eller said, “Friends, family, mentors.” He stressed the importance of long term friendships and finding mentors to guide. “Paper is education and is extremely important,” he added. Eller followed up describing his journey through education with a learning disability and coming up from being behind with reading and writing skills. “I had to apply myself,” he stated. The Gerber Latina Leadership group really is trying something new: college. Mentored by Lambda Theta Nu sorority members, the 7th and 8th grade girls are getting comprehensive guidance to make decisions in high school that will lead to college admissions. The February meeting, the inaugural gathering of the group, included information about Educational Opportunity Program and Upward Bound. Students were also introduced to Collegeboard.com and goal setting. Lambda Theta Nu is a national collegiate sorority with a mission to promote and foster Latina Leaders through educational and professional development, relationship building and community involvement. Corning resident and former city council woman Yvette Zuniga is an advisor. For 30 year old mentor Miguel Garnica, mentoring has become a lesson in the African proverb, “It takes a village to raise a child.” For his 10 year old mentee, Javi, it’s been a lesson in “Hard work pays off.” The two, matched in September 2006, have been collaborating to improve Javi’s grades and develop a support system he can rely on. They’ve also been a having a lot of fun. If you ask them about their meetings, there always seems to be mention of a burger, burrito or milkshake! But it’s not just English, Miguel is helping Javi with. They’re also working on Javi’s Spanish. Miguel related a simple but embarrassing mistake Javi made referring out loud to a woman at the Family Resource Center as an ‘old lady’ in Spanish. “I mostly know English instead of Spanish,” says Javi. “For two weeks he (Miguel) only talked to me in Spanish. It was torture! I can understand it, but I couldn’t really talk it.” Javi then went on to speak extremely quickly in Spanish to prove that in this area, too, he has made improvements. Since then, both Kelen and Maureen have had plenty of opportunities to smile as one of the longest running matches in the Tehama County Mentoring Program. Both say that one of the greatest things about their relationship has been the chance to do things that they never would have done without the benefit of knowing each other. “I introduced her to animals!” says Kelen, “Now she wants a dog!” With that, it’s Maureen’s turn to smile. She’s still not likely to own a dog, but she has opened up to the concept of spending more time around them. To nurture Kelen’s interest in animals, Maureen signed them both up to volunteer at the animal shelter as well as a wildlife rehabilitation center. For Maureen’s part, getting through those initial visits wasn’t that difficult. “I take the concept of commitment very seriously,” she says. “My original commitment was for a year. By the end of the year I realized that this kid was going to be in my life for life. That was a surprise.” Maureen became a mentor because she has a strong inclination towards community service and wanted to do something in youth development. With that, Kelen’s face lights up and you can see her scheming to get Maureen to own a dog.